With smoothie bowls popping up everywhere and looking as scrumptious and colourful as ever, I decided whip one up. Boy was it worth it, it is delicious! 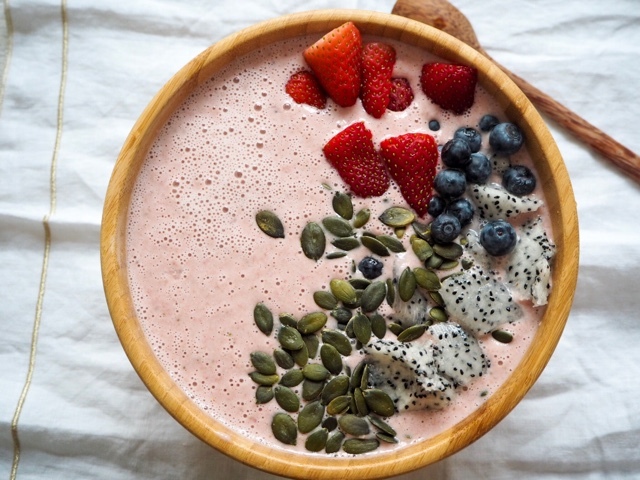 They take no time at all to whip up, 5 minutes if that, so perfect if short for time in the morning and in a rush, this smoothie bowl is super healthy vegan and gluten free too and will keep you filled up for a good few hours. A perfect way to start the day or a sweet refreshing treat throughout. Trust me once your a tried it, you would of wish you had sooner. The best part about a smoothie bowl, is the toppings, literally you can got nuts with it, pun intended! Not keen on nuts go for exotic fruit, I used dragon fruit, first time trying it, tasted like kiwi! Or seeds, seeds is always great add a crunchy texture, especially great for me as I'm not a fan of super soft things, so adding something with a bite is perfect, plus seeds are super healthy and packed with fibre. So glad I whipped this up yesterday how glorious was the weather here in London?! But anyway let's get to the recipe. If you end up trying this bowl, make sure to tag me in your picture over on Instagram #londonmumma Can't wait to see your pictures lovelies. Thinking of making a few others, let me know if you would like for me to pop some recipes below? I love smoothie bowls! Definitely will try this!